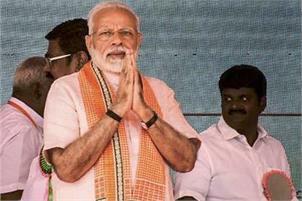 Madurai Virtually sounding the Lok Sabha poll bugle in Tamil Nadu, Prime Minister Narendra Modi Sunday hit out at critics of the 10 per cent quota for the economically weaker sections. A few in the state were creating an “atmosphere of suspicion and mistrust” for ‘selfish’ interests, he said addressing a well-attended BJP rally here. He took a swipe at the proposed grand alliance of opposition parties, saying they had set aside their ‘differences’ to “remove this watchman” in the forthcoming Parliamentary elections. The government was taking effective steps to rid the country of corruption and nepotism, he said, while assuring firm action against economic offenders, even if put up abroad. The Centre’s 10 per cent quota for the Economically Weaker Sections (EWS) in the general category in education and government jobs will not impact the existing reservation benefits for Dalits, Tribals and OBCs, Modi said. The EWS quota had been earmarked with the ‘spirit’ of providing opportunities to all in education and employment. “This decision has been taken in such a way that it doesn’t impact Dalits, tribals and OBCs who are already availing the benefits of reservation,” he added. “It is unfortunate that an atmosphere of suspicion and mistrust is being created by a few people in Tamil Nadu to serve their own selfish interest. I urge all of you to be vigilant and against such negativity,” he said. Opposition DMK and some other parties in the state have opposed the 10 per cent quota, saying social backwardness alone should be the criterion for reservation. The DMK has moved the Madras High Court challenging the Constitution amendment providing for the EWS quota. Modi further said any political thought which opposes the poor cannot benefit anyone, adding opportunities for all cannot be guaranteed as long as there were artificial concepts of high and low or ours and theirs. Further, the union government was taking effective steps to rid the country of corruption and nepotism, he said. “Any person who has cheated or looted the country shall be brought to justice. This is regardless of whether he is in India or abroad,” he said, in an apparent reference to economic offenders Vijay Mallya, Nirav Modi and Mehul Choksi, all of whom are staying abroad. That was why they were all coming together, he said in an apparent reference to a proposed grand alliance of major opposition parties, including the Congress and DMK. “They say that keeping aside all other considerations they must unite to remove this watchman. However big a group they form, out of fear and negativity, Narendra Modi will stand firmly with the poor,” he said. “And I call upon the people of Madurai and the youth of Tamil Nadu to reject these forces of negativity,” he said. Modi, who started his address by extending salutations in Tamil, hailed Madurai for being a seat of the ancient Tamil Sangam, and a pilgrimage city. He also paid tributes to the late Chief Minister J Jayalalithaa on the occasion. Work was on to establish one medical college in every three Lok Sabha constituencies which was being done with the objectives of improving medical services and providing avenues of education and employment to the youth, he said. Besides direct intervention in health care, the Centre was also focused on preventive health care and the Swachh Bharat initiative has become a people’s movement with marked increase in rural sanitation, he said. Nine crore toilets have been built in the last four years, with 47 lakh of them in Tamil Nadu, he said. The government was working to improve the ease of living for the poor and middle class, Modi said while highlighting the increased focus on connectivity including highways and airways. The speed of building highways and laying railway lines has doubled, he said, adding projects pending for years have been expedited. The government has started work on a Rs 2,100 crore project to link the holy island of Rameswaram and Pamban in the state, while a new a Pamban bridge is being constructed to facilitate people in the region, he informed. Madurai and Chennai will be now connected through the ‘ultramodern’ Tejas train while the country’s fastest Train 18 will in times to come provide high speed connectivity across the country, he said. Developed at the Chennai-based Integral Coach Factory (ICF), Train 18’s largescale production will create jobs for Tamil Nadu youth, the Prime Minister said, adding several other countries have also evinced interest in it. On the Devendra Kula Velalar community’s demand to be scrapped from the Scheduled Castes list, Modi said he was “fully sensitive” about it. A ‘significant’ progress has been made on the matter, he said and assured ‘justice’ to the community, which wants to be included in the OBC list.